Work in progress picture of A-12742 WPC89 board with data+address lines. edit 2017jan13: --deleted-- Bigger Picture. Need to check all data but quite happy with it already. only with PDF it will stay as an uncompressed bitmap so PDF it is. zaza last edited this post 2 years ago. Oh wow, this will be nice. Thanks! Handy for rebuild after leaking batteries damaged the lower part of the CPU-board. Zaza, you're a tease! haha. I hope you have plans to do WPC-S and WPC95 drawings as well. Yeas, I did also WPC-s and WPC95 layout but not as detailed as WPC'89. Not sure when/if I'm gonna finish them. The mirrored version of WPC'89 (view from solder side) is also almost ready and will be placed here as well. (and likely on pinwiki). There will be empty spaces in that picture to keep it more clear and only relevant to measure connections to ASIC and other data/address lines. Flipped version of the CPU-board. ASIC is easier to measure from this side. Nice work, as usual, zaza. Amazing work. Thank you for the contributions. zaza last edited this post 1 year ago. 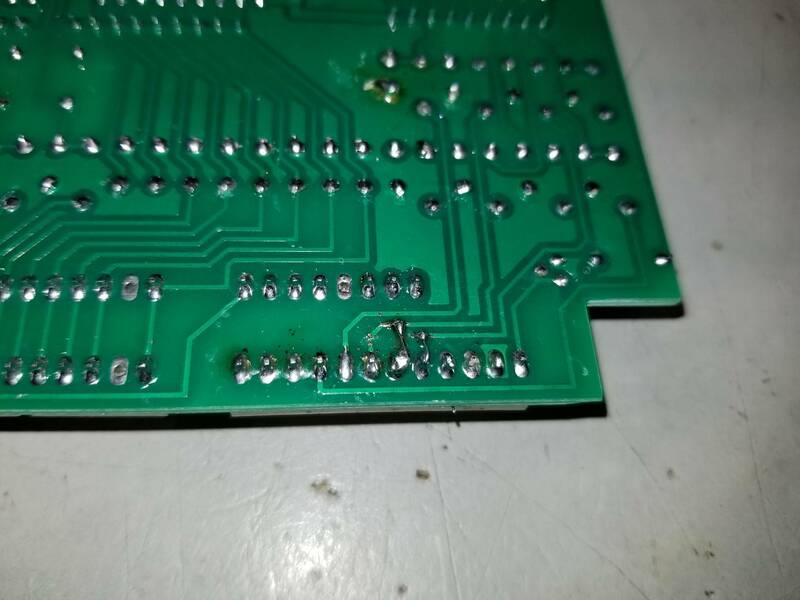 I just found a broken trace on a board I was working on using your diagrams. Thank you! Can I get the pdf version of the layout? I just noticed a discrepancy between the WPC89 and WPC95 schematic with the ASIC chip. Pin 48 and pin 50 are reversed. I'd assume the WPC 95 schematic is correct because it is newer, but I havent checked a real PCB yet. 89 schem left. 95 schem right. 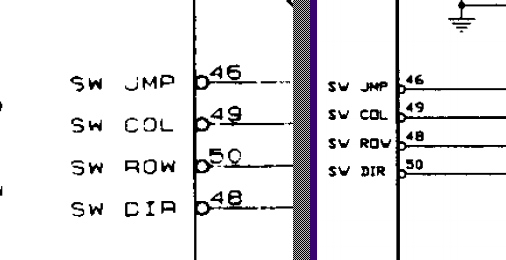 in the '89 manual, sw-dir and sw-row are wrong assigned. The manual has also an inconsistentcy in sol#1-sol#4. On the page with WPC-CPU, the sol-enables are mixed up with the next pages of the PowerDriverBoard. Therefor the ASIC picture in post #7, sol#1-#4 are accompanied with the actual solenoid group. I believe this is another WPC89 schematic error. 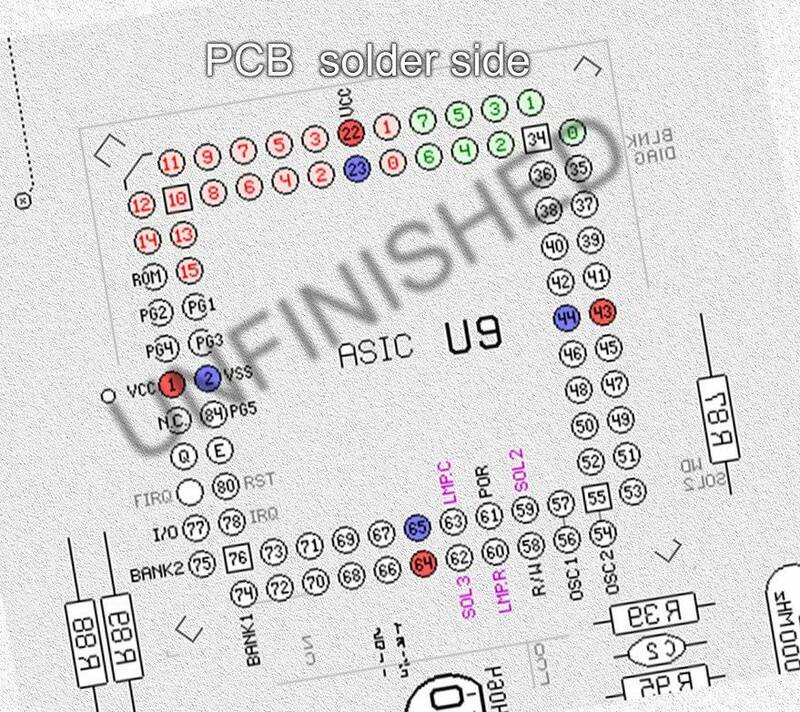 On the schematic drawing U17A and U17B need swapped compared to the PCB. U18A and U18B also need swapped on the schematic compared to the drawing. Proposed corrections in red. This one needs double checked too. Looks like the schematic drawing got penciled in changed but the board didnt update. The WPC95 schem has the gates drawn the same way, so perhaps the change actually happened on later boards?? Might have been last minute change to make the track routing easier. Better use the full picture in post #1 when troubleshooting the switches, it is verified over and over again. When I'm doing repairs on this CPU-board, all I need is that picture. Oh wow Zaza i didn't see that picture with the complete pin out because some bonehead marked it as "unsafe picture". I clicked show anyways and then bang.... Nice work. I recreated the entire schematic and that would have helped me out. Some moderator should "un hide" that picture. that would be me as I made it only visible for Pinsiders this way. With settings 'auto hide' one level higher, you can see all hidden pictures without having to click them open. Built a WPC 89 prototype today and found that J205 is all mixed on the schematic compared to a real PCB. Pin5 is key, not pin10. Pin10 is ground not pin11. Looks like Zaza has the direct switches, ground, and the keying corrected on his pin out map. The enable pin is indeed still pin12 (goes to q1). You post more informative stuff with awesome diagrams and explanations in this one thread then some "arm chair wise-cracking" pinsiders do for 5-6 years. Please don't ever leave, zaza. don't worry, I won't leave this site. 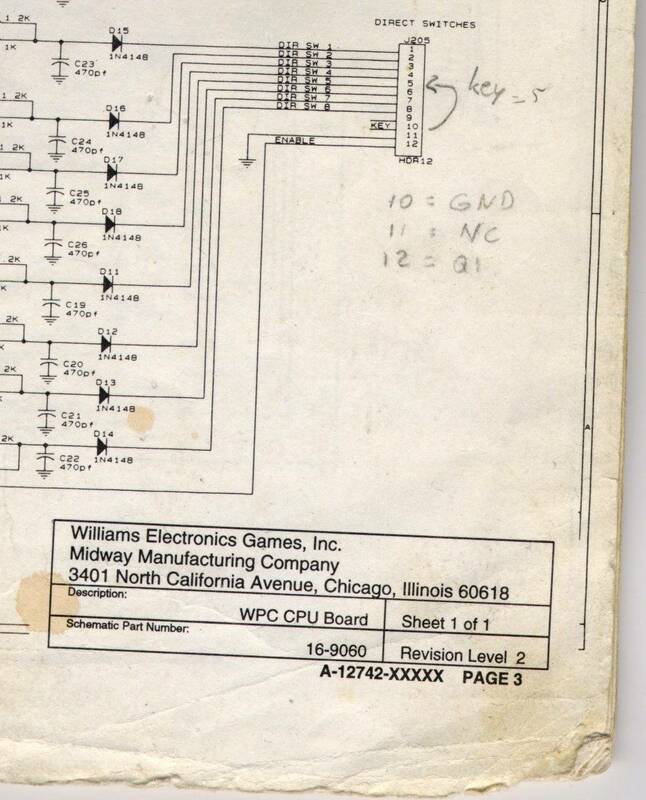 Have to say the WPC89 original schematic has by far the most errors on it of any pinball pcb i have tried to recreate. I don't think I have ever noticed a problem with old Bally schematics. I almost wonder if they where worried someone like DE was going to rip off their engineering design again, but I guess that ASIC would be a road block. Probably just a bad schematic drawing and the guy doing the board layout fixed or changed a bunch of stuff that never made it in. Woah, woah, woah. What is this. Art-class for beginners? 90 dregree, then 45, then 90 again? I have been professionally trained, by myself =D. Why does everyone hate right angles on PCB design? The electrons are not going to fly out of alignment. You should see what the autorouter does when you let it rip. It's like computer generated abstract art. 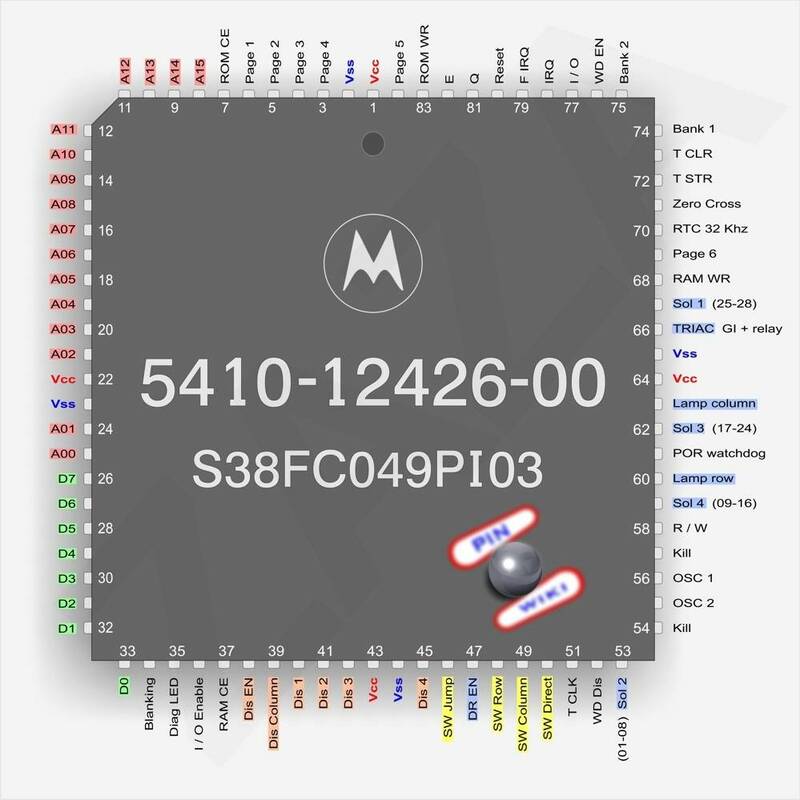 Is anyone going to consolidate and correct all the mistakes and create a corrected version of the CPU schematics? It would be nice to put it in the WPC schematic booklet and void the original. I guess same goes with the PDB, sound, DMD driver and any other WPC boards if they are wrong. Personally, i was taught to use 45-degree angles - not for fear of losing electrons, but back in the earlier days of PCB, the copper 90'degree corners lifted a lot easier, leading to broken traces. Hell, the pre-DCS schematics (that I have, anyways) literally have two chips listed as "U?". Apparently, the schematics were never corrected once the final board went to manufacturer. Is anyone going to consolidate and correct all the mistakes and create a corrected version of the CPU schematics? Not me. Sometimes I make notes / corrections in the schematics with a marker or pencil like picture in post#21 or here below. two chips listed as "U? Did you notice the 'vcc' at U5-8 and u1-5 ? Better not connect them together because U1-5 is the +25V power for the amplifier. In WMS defence there, the chip's 8designation* for that pin (i.e. What's marked in the datasheet) is VCC. 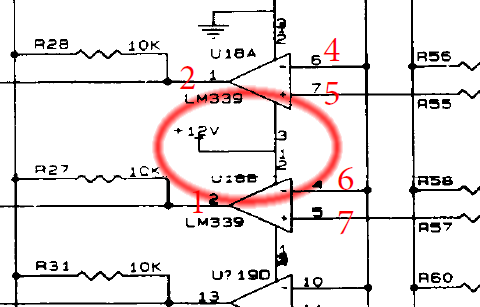 However, if you follow the trace (which should always be done - never base net connections on what mfg's call/name chip pins) it is connected to the '+12A' signal. 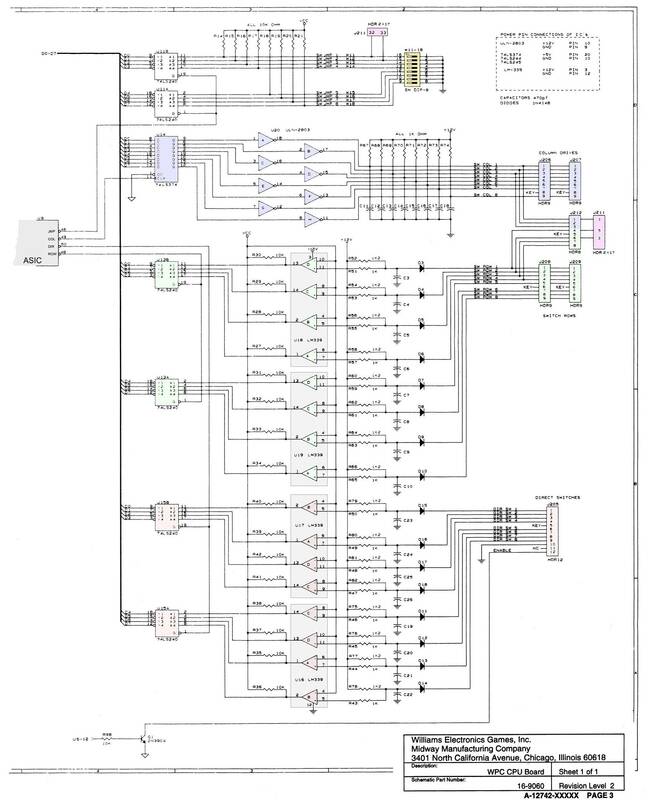 I'm rebuilding a pre-DCS sound board (for my own use.. if it comes out successful, and others want it, I may have some made), and 99% of my time has been verifying what's on the schematic to what's actually on the board - not counting chips with multiple gates (i.e. 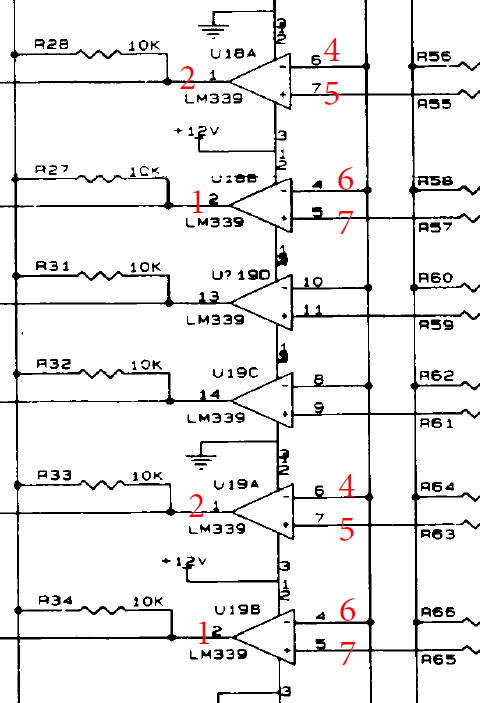 2 AND gates - I don't care if the schematics have the wrong fate listed.. Operationally it's still the same.).. Yes, verifying is time consuming with drwaing schematics and pictures. That makes me think that the errors are not made deliberately in the manuals but caused by time frame limit. I agree - usually deliberate errors (like what used to be done on paper maps years past) were OBVIOUS once you caught it, but were small enough that unless you were looking for it, it wouldn't get noticed. (A driveway with a road name? A road that makes a sharp turn to the right and dead ends?).. Same here, reading glasses all over the place. I am typing in RED, like shown the post I made a few months back, on top of the WPC89 schematic PDF the errors I found which I can probably release. With Zaza's help, I ~~~ THINK ~~~ , have found them all as i got my WPC89 prototype booting up and playing HSII just fine. as i got my WPC89 prototype booting up and playing HSII just fine. Having poured through (and cursed at) my WPC schematic manual, I thank you for cleaning this stuff up. This will make working on these boards so much easier.